Two new atherinid fishes, Hypoatherina celebesensis and Hypoatherina macrophthalma, are described based on specimens collected from the tropical western Pacific. Both new species are closely similar to Hypoatherina ovalaua in general appearance and having the long and distally narrow premaxillary ascending process, but differ from the latter in lacking a tooth patch on palatines and having a longer head [27–31 % of standard length (SL) vs. 25–28 % SL]. Hypoatherina celebesensis can be distinguished from H. macrophthalma by having the midlateral band running downward anteriorly (vs. running straight), and a smaller upper jaw (9.3–11 % SL vs. 10–11 % SL) and eyes (9.6–11 % SL vs. 11–12 % SL). Hypoatherina celebesensis is known from Singapore, Indonesia (North Sulawesi and Timor), and Palau. Hypoatherina macrophthalma is known from Vietnam, Thailand (Gulf of Thailand), Papua New Guinea, and Micronesia. We are deeply indebted to T. Peristiwady (Indonesian Institute of Sciences) for donation of specimens to FRLM, and to M.E. Anderson (SAIAB) for his critical comments on an earlier draft of the manuscript and his great help with the English language. We are most grateful to the following persons and institutions for specimen loans: M. McGrouther (AMS); J. Maclaine (BMNH); D. Catania and M. Hoang (CAS); T. Nakabo and Y. Kai (FAKU); M.-A. Rogers (formerly FMNH); G. Duhamel, P. Pruvost, and R. Causse (MNHN); Y. Iwatsuki (MUFS); K. Matsuura and G. Shinohara (NSMT); K. Miyamoto (Ocean Expo. Research Center); M.J.P. Oijen and R. de Ruiter (RMNH); T. Yoshino (formerly URM); J.T. Williams, L. Palmer and S. Raredon (USNM); P.K.L. Ng and K.K.P. Lim (ZRC). We also thank Y. Hibino, S. Takeuchi, and other students of FRLM for their cooperation in field collections. This study was supported in part by Grants-in-Aid for Scientific Research (C) awarded to S.K. 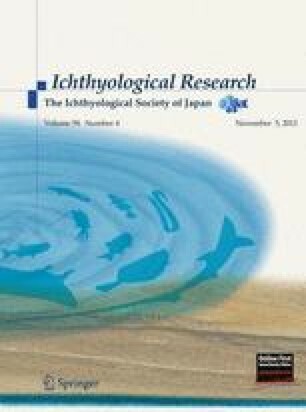 by the Japan Society for the Promotion of Science (11640696, 14540642, 19570084, and 23570114) and by the Multilateral Cooperative Research Program (Coastal Oceanography) and Asian Core Program of the Japan Society for the Promotion of Science.